Energy storage is becoming increasingly diversified. The market can be broadly classified into three distinct categories. The first is made up of consumables such as smartphones, which is very big volume business and constitutes the largest part of the market. The second market is ‘behind the meter’ applications, including residential, commercial and industrial energy storage solutions. The third market is for large-scale industrial solutions, which includes storage for electricity networks, covering generation, transmission and distribution. This segment also incorporates storage systems for mass transportation fleets, such as electric buses, ferries, boats and trains. Electric cars are currently between the industrial and the consumer sectors. In light of recent technological developments in energy storage, a shift is taking place that will enable major economic, environmental and social benefits. At this very exciting time in the field, European CEO had the chance to speak with Anil Srivastava, CEO of Leclanché, 2015’s fastest-growing company in the industrial energy storage business. How has the market for battery energy storage systems (BESS) changed in the last year or so? Actually it has changed a lot. With cars, it’s less about batteries and more about the business model. It’s not possible for every car manufacturer to have its own charging stations, so, at some point, standardisation will take place. Nothing has emerged yet in terms of charging infrastructure standardisation, but the ongoing debate is definitely going to yield some results. The part that is particularly interesting from Leclanché’s perspective is large-scale industrial storage. If you look at the lithium battery business, it went through a dip after a period of hype, and then for the first time, in 2015, utilities firms, transmission operators, and distribution system operatives started large-scale procurement for electricity storage. We are named after the inventor of dry cells, Georges Leclanché, and the company was established in order to make his patent industrial in 1905. Over a century later, Leclanché remains the largest manufacturer of lithium batteries in Europe. In 2006, the company decided to discontinue all traditional battery technology, namely lead acid, in order to commit fully to the lithium business. Between 2007 and 2012, Leclanché built its own portfolio of lithium BESS, and we have since become the world leader in lithium titanate oxide (LTO). We currently have more than 100 patents in this area, and we also have the largest lithium manufacturing facility in southern Germany. LTO is good for long-life batteries on an industrial scale. It has a fast charge, but a low energy density, so you wouldn’t put this technology in a car. LTO is, however, great for a bus, where you have more space and it can charge very quickly and frequently along a route of prescheduled stops. We are also one of the few companies in the world to offer dual technology, which can cater to customer-specific applications and asset life expectations. Moreover, Leclanché is one of the most vertically integrated BESS providers in the world. Even though there are much bigger companies in South Korea, such as LG and Samsung, we develop our own electrochemistry and build our own cells, as well as the software for the battery management system. We design, manufacture and deliver turnkey projects – that’s what sets us apart. What challenges do you face at the moment in the market and how do you plan on overcoming them? The good news is that large-scale procurement is finally happening for bigger systems in our markets. A big challenge that still remains, however, is to provide fast-response BESS to cope with increasing grid requirements. Unlike many CEOs of green energy companies, I’m not for subsidies and grants, as I believe that business must stand on its own two feet, and I know that energy storage can facilitate this. Therefore, we need a market structure that rewards battery technology and battery-based energy storage systems. Unlike power plants, BESS are two-way: you can charge and discharge. A BESS is a software-based, flexible system that can be used rapidly in multiple applications from the same system at any time. Most of the regulations in the electricity market, on the other hand, are designed for a slow response and for one application at a time. So, the challenge the industry faces is how to evolve market regulations to recognise flexibility, multiple-application platforms, and the much faster response of battery-based energy storage systems. What other big projects does Leclanché have in place? Graciosa – named for the island where it is installed – is a micro-grid project in the Azores, Portugal, which has its own generation, transmission and distribution in place. We built an entire electricity network on this island, which will be powered over 65 percent by renewable sources – wind and solar. Its dispatchable, reliable energy storage is a world first, with diesel completely off for significant hours in a day. Without such mechanisms in place, there are numerous times when more power from renewable sources is generated than the grid can take or needs. That’s wasted energy that taxpayers pay for. This is the ugly part of the renewable energy system at present – we are not addressing how to eliminate this colossal waste of green energy. Graciosa, a project that we have already delivered and is opening officially this summer, resolves this. However, the biggest project that we are currently constructing is in Ontario, Canada. At 53MWh, it is the largest storage system being deployed in the world today. It will provide a very high-frequency response rate, as well as voltage control that will stabilise the grid and better integrate renewables. A conventional power plant has something called a ‘must-run capacity’, which means that, if you have a 100MW coal plant, it will be running at three to five percent more in order secure a high frequency response. So, whether you use it once a day for three seconds or for three hours, or you don’t use it at all, it’s always burning coal or gas. Our new technology, however, eliminates the issue of must-run capacity from conventional power plants, thus drastically saving fuel and reducing emissions. Because batteries react very quickly, you don’t need to run energy all the time. So, that’s our overall objective: to stabilise the grid, offering very high-frequency response, and to reduce the colossal wastage of energy. 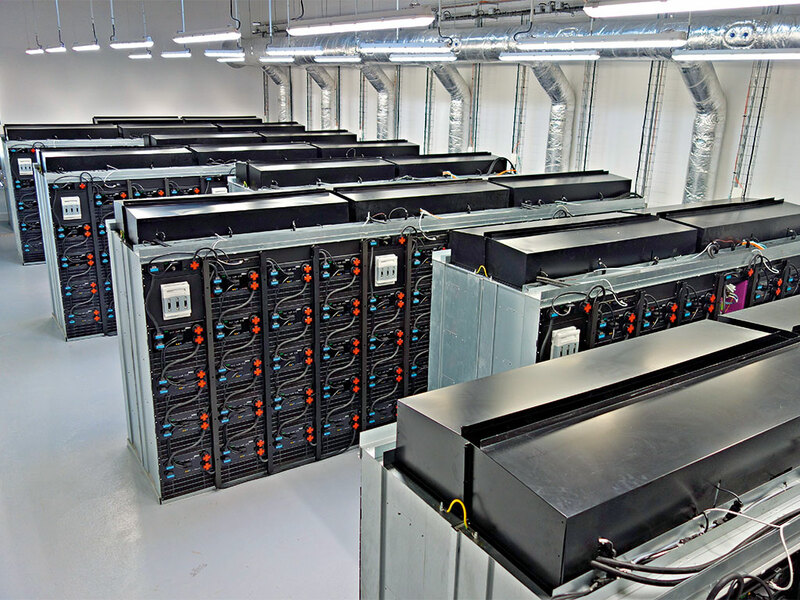 What does the future hold for the energy storage market in general? First and foremost, the deployment of large-scale energy storage systems within an electricity network will go hand-in-hand with larger proportional renewable energies. I believe that we are going to see a large-scale infrastructure type of deployment of storage that will better integrate renewable energy, and make it more dispatchable and more reliable. Last year was a great year for that, but it was just the tip of the iceberg. We see energy storage systems going into the electrification of mass transportation systems, namely buses, ferries, trams and specialised vehicles. There will also be a massive deployment of storage into mass transportation fleet, including industrial machinery, fleets of buses, and trains. There’s also a third trend that we believe will take place, which is the displacement of lead-acid batteries for industrial applications. For example, material-handling forklift trucks in a warehouse all run on lead-acid batteries, and fleet utilisation is usually 50 percent or less; when one set is working, the other set is charging. However, if you replace the system with modern batteries, your fleet utilisation literally doubles. All in all, the coming years will see many changes in energy storage and delivery that will be hugely beneficial, and we look forward to playing a central part in it all.